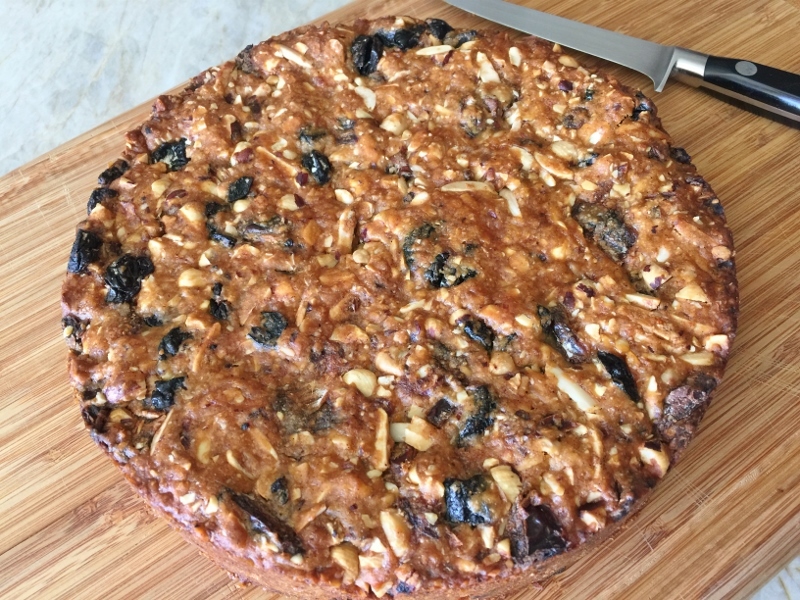 Panne Forte - Recipe! - Live. Love. Laugh. Food. After traveling through Italy a month ago, I realize how well Italians do coffee – they really respect their espresso time and savor each and every sip. Usually coffee, cappuccino and espresso are accompaniment by biscotti or a wedge of something sweet. I noticed a little dunking going on, but not just that – they really enjoy their warm beverage with a bite of an Italian treat to enhance the overall experience. 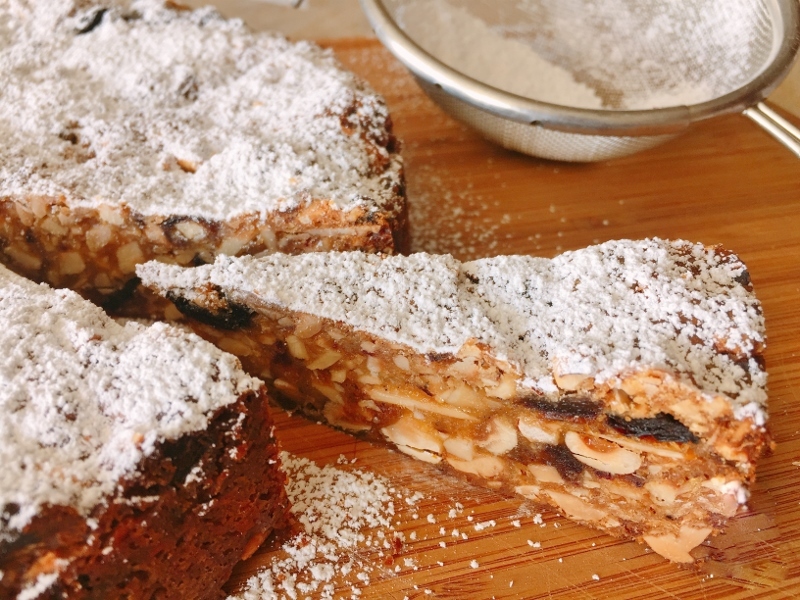 Panforte or sometimes spelled Panne Forte, means strong bread – it’s not really bread, but a nut and fruit cake that is dense and chewy and often served at coffee time. Let’s not confuse this Italian treasure with our American version of fruitcake, no comparison. 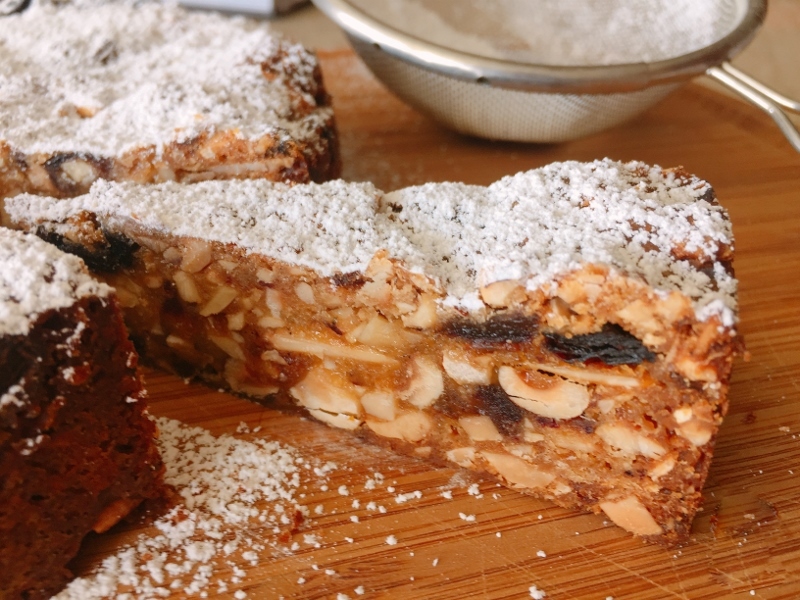 Panne Forte is a a nutty experience with a denseness that is made from dried fruits like plums, cherries and dates. There is almost always a nice essence of orange and a bit of cinnamon in Panne Forte, and the aroma is mouthwatering. This recipe for Panne Forte I adapted from, “Bake from Scratch” by Brian Hart Hoffman and it is truly a nice treat. 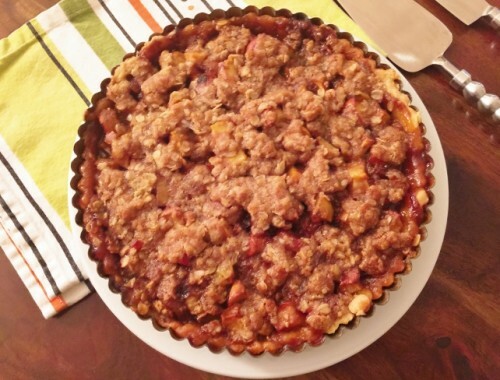 It is super easy to prepare – just chop some nuts and fruits and add a thick honey based syrup and bake. I like to serve mine just a tad warm, before it hits room temperature because it elevates the taste. You can store it in the refrigerator wrapped in plastic for a week or more, and slice it up with your coffee daily, or serve it after a meal with friends. 1. Preheat oven to 325 degrees. Grease a 9-inch springform pan, set aside. 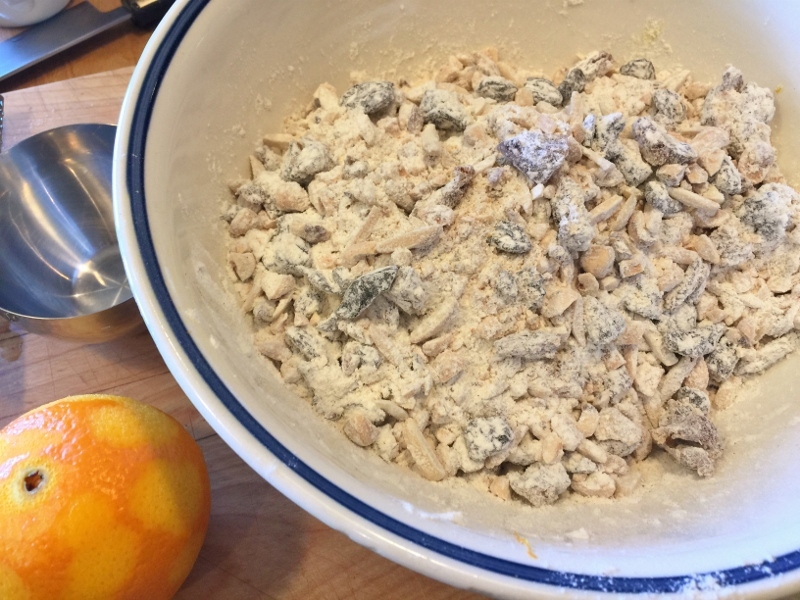 In a large bowl, add all nuts and fruits, toss to combine. Add the flour, zest, vanilla, cinnamon, ginger, salt and pepper, toss again. 2. 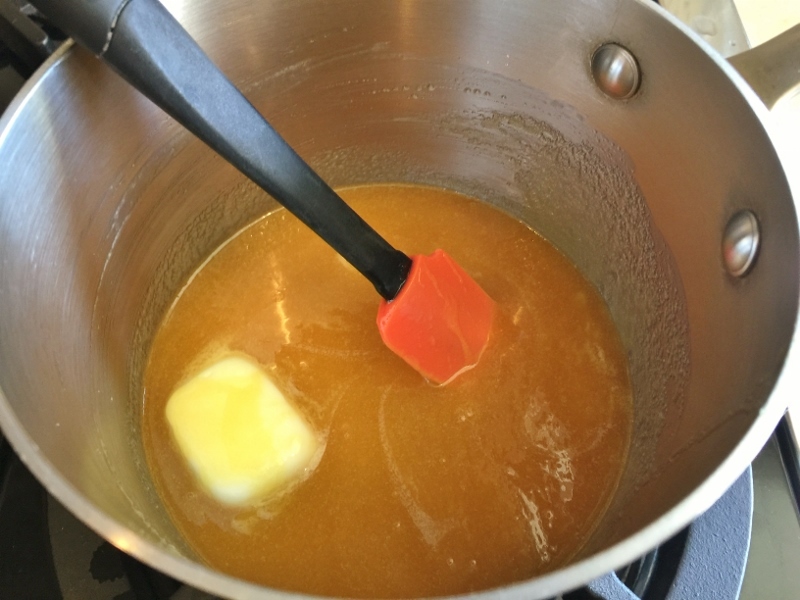 Add Syrup ingredients in a small saucepan, and place over medium heat. Cook until boiling and sugar has dissolved, about 3 minutes. 3. Pour syrup over nut mixture and stir to combine. Spoon into prepared pan and press until even. Bake for 35-45 minutes, or until edges are golden brown. Remove and let cool for 20 minutes. Using a knife, loosen around the perimeter and remove ring. Lift off of pan base with spatula and place on a cutting board, let cool 30 minutes. Sprinkle with powdered sugar and cut into wedges, Enjoy with coffee of course! 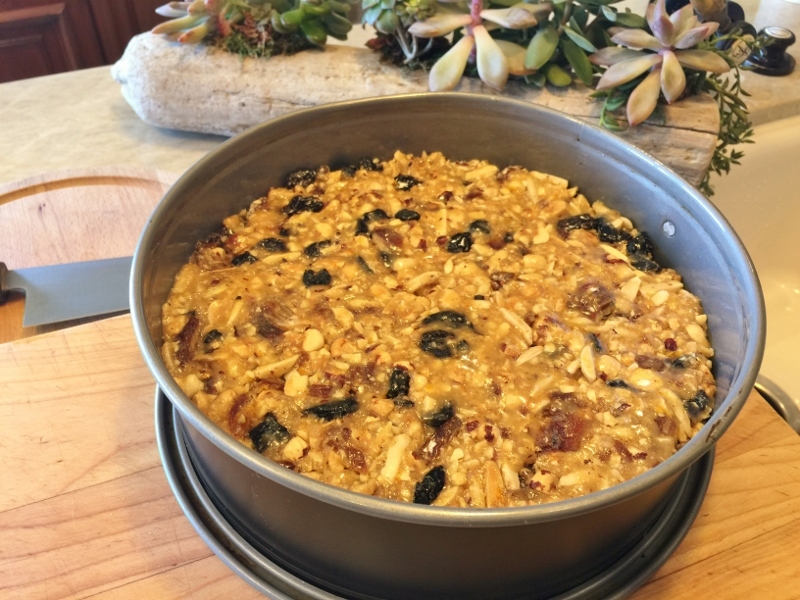 Baking with Gena BellFruit and Nut BreadFruit and Nut CakeFruit and Nut RecipesItalian BakingItalian DessertsPanforte RecipePanne Forte - Recipe! 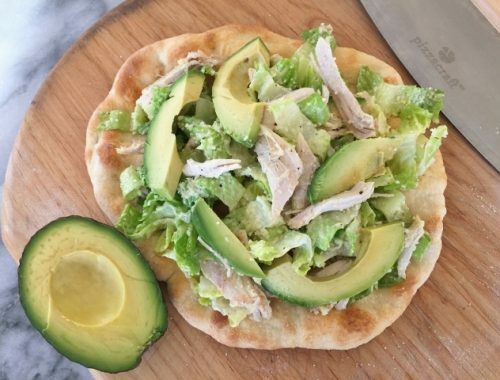 Chicken & Avocado Caesar Salad Flatbread – Recipe! 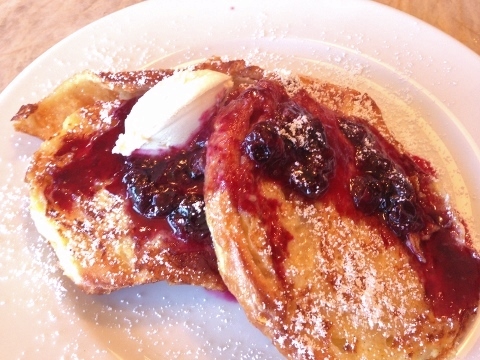 Croissant French Toast with Blueberry Honey Syrup – Recipe!